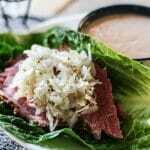 These Paleo Reuben lettuce wraps are the perfect gluten-free and dairy-free alternative to this traditional St. Patrick’s Day dish. 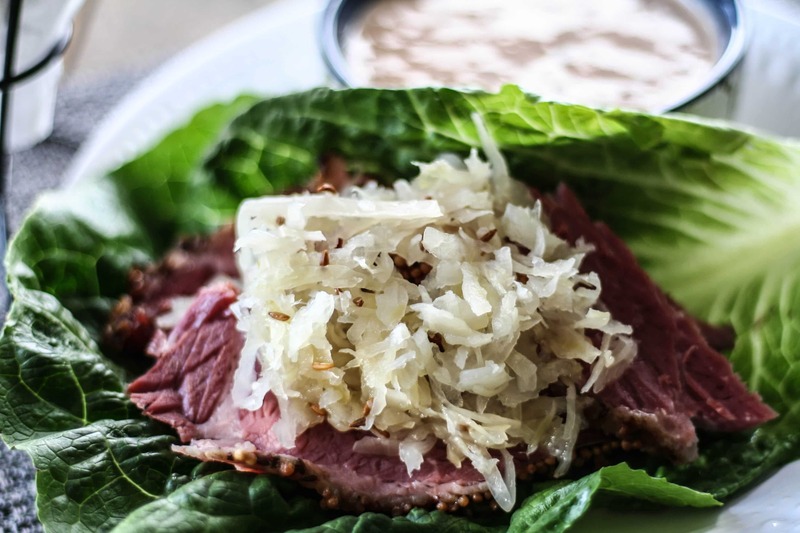 You can easily make the corned beef ahead of time and have it meal prepped and ready for lunch, or enjoy for dinner, whatever you choose! What is a traditional Reuben sandwich? Traditional Reuben sandwiches are a grilled cheese style sandwich that is typically made with sliced corned beef, swiss cheese, sauerkraut, and Russian dressing. 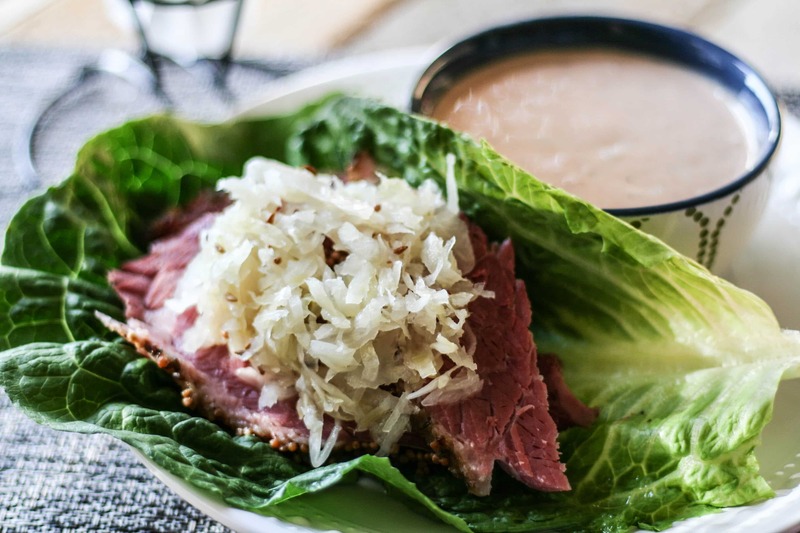 Depending on who’s making the sandwich, sometimes Russian dressing is swapped out for Thousand Island dressing, pastrami for the corned beef, and cole slaw for the sauerkraut. The best Reubens are made with thick slices of roasted corned beef, rather than the thin lunch meat style corned beef. This sandwich has also somehow become the traditional meal around St. Patrick’s Day, although I’m not sure on the history as to why. 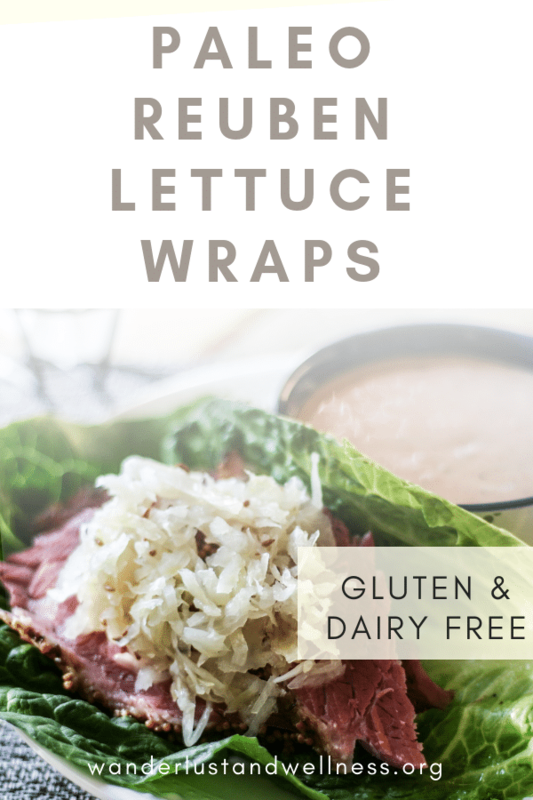 If you’re needing a gluten or dairy free alternative to this traditional sandwich, these Paleo Reuben lettuce wraps have you covered. 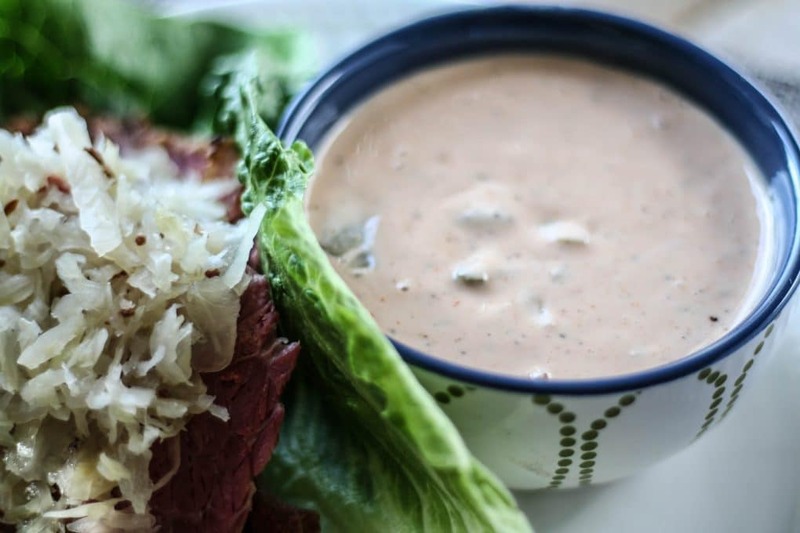 Here are a few easy swaps to help you transform your Reuben into a delicious gluten and dairy free meal. For this recipe, you can use a homemade Paleo mayo recipe, or use a good, store-bought dairy-free mayo like Sir Kensington’s. Once you’ve mixed up the dressing, store it in a jar in the refrigerator until ready to use. The longer it sets the more chance the ingredients have to meld together into a zesty dressing! A homemade batch will last about two weeks in the refrigerator, longer than that and you’re on your own for that science experiment. Don’t let these delicious romaine wraps fool you, they are heavenly. You won’t even miss the rye bread! 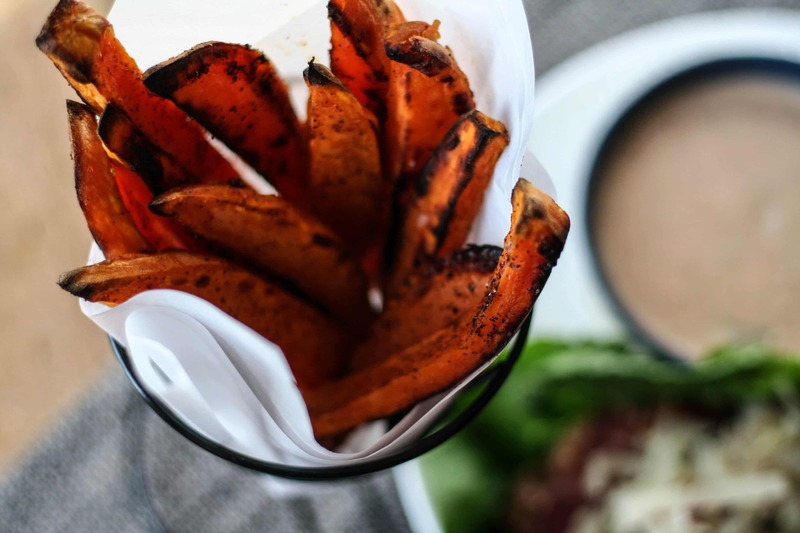 I served these wraps with a side of my Spicy Sweet Potato fries (which are also great to dip into the Paleo thousand island dressing…just sayin’). Rub seasoning packet onto corned beef. (Most corned beef will come with its own seasoning packet). Bake the corned beef brisket according to the package directions. Typically it’s one hour per pound. You’ll want to cook it until its fork tender. If you liked this gluten-free recipe, check out these! Previous Post: « Eeek! My Very First Blog Post! !